Even though a Bloom filter can track objects arriving from a stream, it can’t tell how many objects are there. A bit vector filled by ones can (depending on the number of hashes and the probability of collision) hide the true number of objects being hashed at the same address. Knowing the distinct number of objects is useful in various situations, such as when you want to know how many distinct users have seen a certain website page or the number of distinct search engine queries. Storing all the elements and finding the duplicates among them can’t work with millions of elements, especially coming from a stream. When you want to know the number of distinct objects in a stream, you still have to rely on a hash function, but the approach involves taking a numeric sketch. A hash converts every element received from the stream into a number. 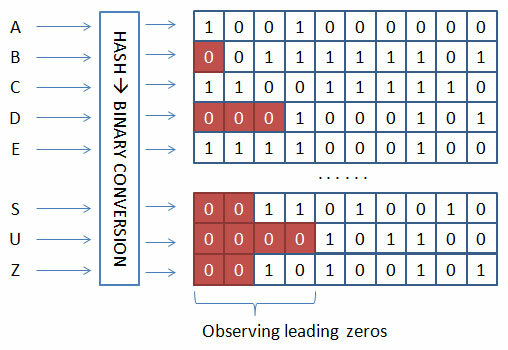 The algorithm converts the number into binary, the base 2 numeric standard that computers use. The algorithm counts the number of initial zeros in the binary number and tracks of the maximum number it sees, which is n.
The algorithm estimates the number of distinct elements passed in the stream using n. The number of distinct elements is 2^n. For instance, the first element in the string is the word dog. The algorithm hashes it into an integer value and converts it to binary, with a result of 01101010. Only one zero appears at the beginning of the number, so the algorithm records it as the maximum number of trailing zeros seen. The algorithm then sees the words parrot and wolf, whose binary equivalents are 11101011 and 01101110, leaving n unchanged. However, when the word cat passes, the output is 00101110, so n becomes 2. To estimate the number of distinct elements, the algorithm computes 2^n, that is, 2^2=4. The figure shows this process. The fewer the numbers that HyperLogLog sees, the greater the imprecision. Accuracy increases when you use the HyperLogLog calculation many times using different hash functions and average together the answers from each calculation, but hashing many times takes time, and streams are fast. As an alternative, you can use the same hash but divide the stream into groups (such as by separating the elements into groups as they arrive based on their arrival order) and for each group, you keep track of the maximum number of trailing zeros. In the end, you compute the distinct element estimate for each group and compute the arithmetic average of all the estimates. This approach is stochastic averaging and provides more precise estimates than applying the algorithm to the entire stream.